Wren Darby can do things that other people only dream of. Make snow fall on a clear, crisp day. Fly through an abandoned tunnel. Bring people back to life. Wren learned the hard way that her abilities are tinged with danger, but she can’t resist their intoxicating rush. And now that she’s with Gabriel, someone who knows what she can do—what she has done—she finally feels free to be herself. But as Wren explores her simmering powers, Gabriel starts to grow wary, telling her the risks are too high. And by the time she realizes he may be right, it could be too late to bring him back to her side. Cold Kiss took readers on an unforgettable journey through love and loss, which VOYA compared to “Stephen King’s Pet Sematary—creepy with the emotional impact of first love.” Amy Garvey once again captures the heart-fluttering joy of true love, as well as the pain of accepting the past and embracing the future. 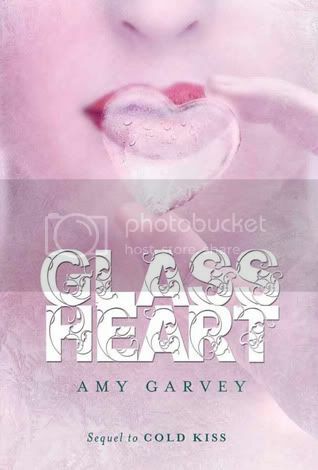 Glass Heart is perfect for fans of bestselling paranormal romances like Shiver and Fallen, as well as Gayle Forman’s If I Stay. I want to start off by saying I LOVE the cover for this book! It's very pink. :) Moving on... Last year, I read and enjoyed Cold Kiss. When I finished the book, I had so many questions! I am hoping that some of them will be answered in Glass Heart. Haven't read the first book yet, but they both have oh such pretty covers. :D Great choice! *sigh* this cover is so pretty! I haven't read the first book since I'm not such a big fan of ghost stories, but somehow this one intruiges me.. It's such a pretty cover, but I don't really think it matches up to Cold Kiss. Awesome pick! Seeing this a bit today! Haven't read the first one either, but the covers are very pretty! I am hoping this book has the answers to those questions as well! I do love the cover of this, and think it compliments the first one really well. I haven't read the first one, but this sounds very cool. I love waiting for sequels. I haven't read Cold Kiss but I love the covers of this series !!! I look forward to know what you think of this one Christy and if it brings you some answers =) !! I need to read Cold Kiss asap..love the cover! I like the cover.Great review! I love the cover too! I'm not a huge fan of pink this one is done right. I have tons of questions. I hope they're all answered! I haven't read Cold Kiss, but it's on my TBR list! Hope you enjoy the sequel once you get the chance to read it! I can't wait for this! Cold Kiss had so many mixed reviews but I loved it and I'm really excited to find out more.